William Daniels is a young artist, born in 1976 in Brighton, England. Daneils uses oil paints on wood to create his trompe l’oeil styled art. Before making his art, inspired by famous historical paintings, he constructs models of what he wants to paint using common materials like tinfoil, paper and cardboard. Then he painstakingly recreates the look in oil paints. Included in this project is a PowerPoint presentation of Daniels’ art. 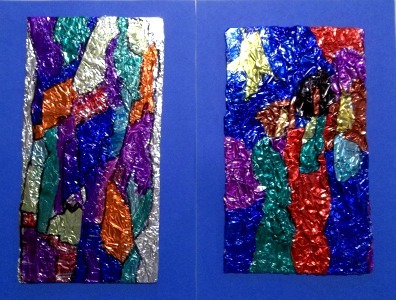 Find the instructions for this project, “Foil Painting ala William Daniels,” under the 5th Grade Projects Gallery in the right sidebar. This entry was posted in Categories and tagged 5th Grade, art, arts and crafts, elementary art, foil art, foil painting ala william daniels, tinfoil, tinfoil art, tinfoil painting, trompe l'oeil, william daniels, william daniels art. Bookmark the permalink.